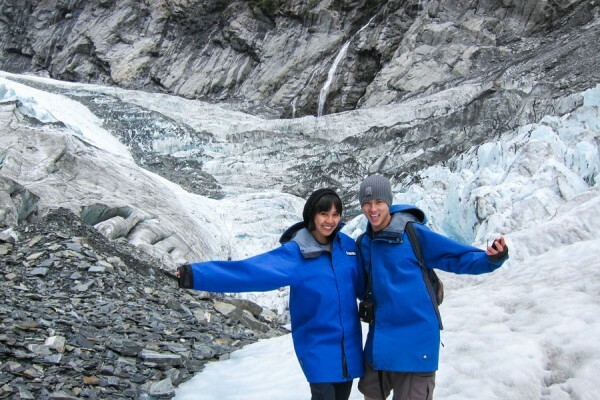 New Zealand is beautiful every which way you look at it: the mountains, the lakes and even glaciers! And, we got to walk on one. 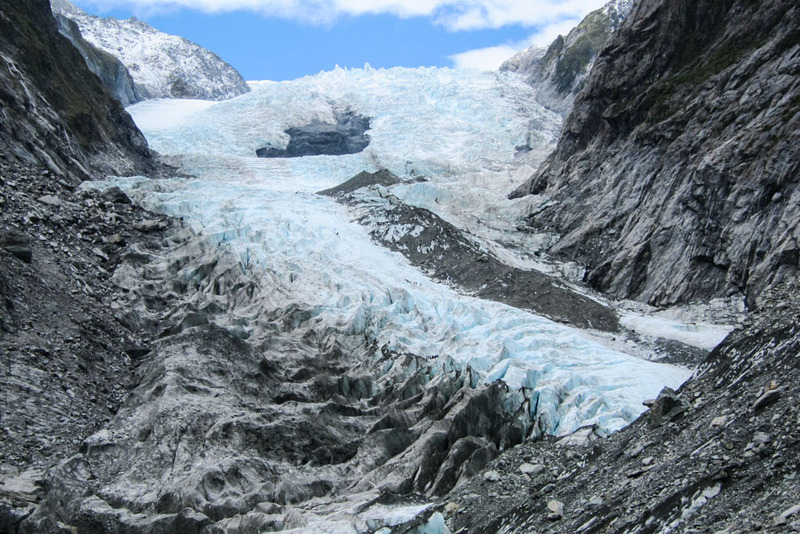 I mean, how often do you get to say, I walked a glacier today? Well on this day, we did. Franz Josef is a small town. 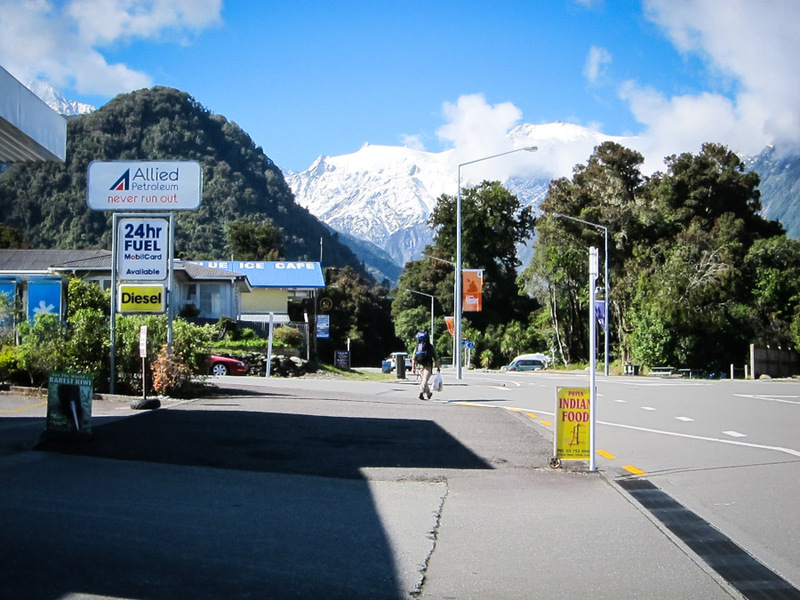 Then again, any town in New Zealand is pretty small with one major intersection, a handful of restaurants, a mini mart, cafe and gas station nestled beneath the snow capped mountains. We arrived late afternoon, checked into our hostel and decided to wander a bit before grabbing dinner and calling it a night. It was a long drive from Blenheim. 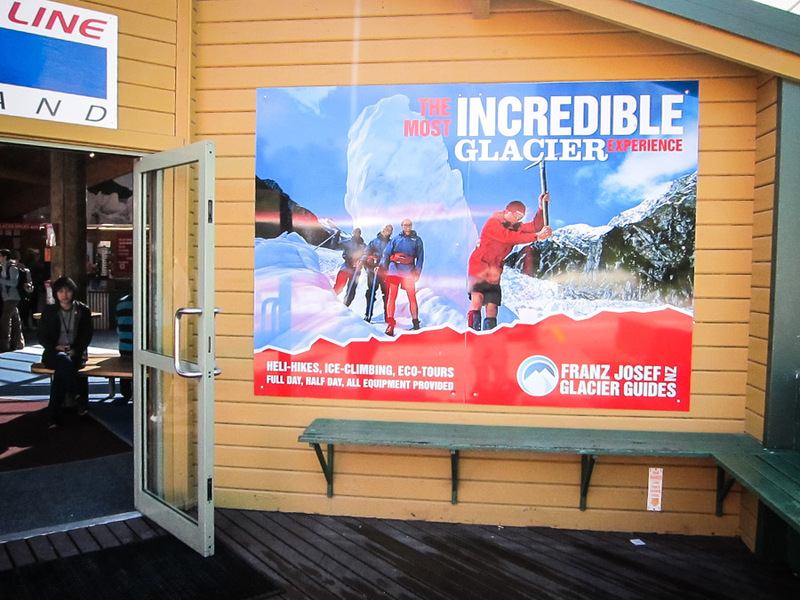 The next morning, we dropped by the Franz Josef Glacier Guide company and started our half-day tour. It’s a short bus ride up the mountain before we all got out and started walking. We trekked through some forest and bushes before making it to the clearing to see the glacier. 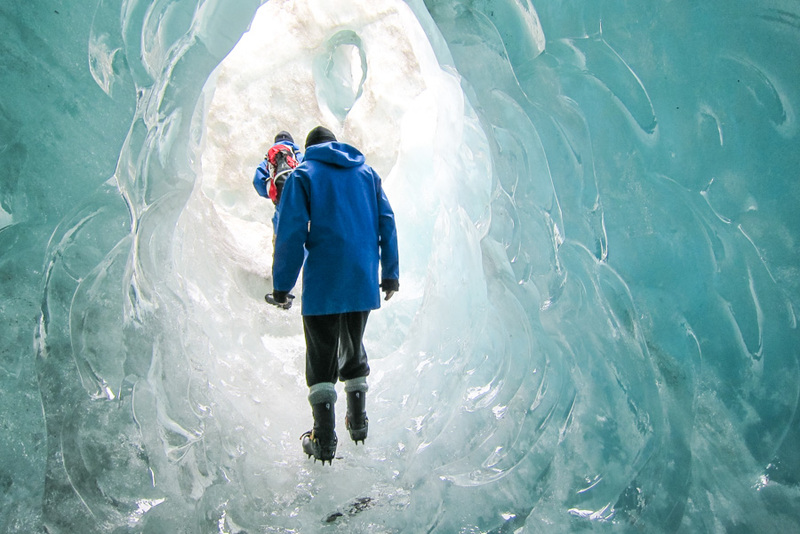 Don’t be fooled by the distance — the glacier is a lot farther than it looks. And even though the walk was on flat surface over gravel and rocks, some people didn’t make it pass this point. We eventually made it to the bottom of the starting point for our climb. 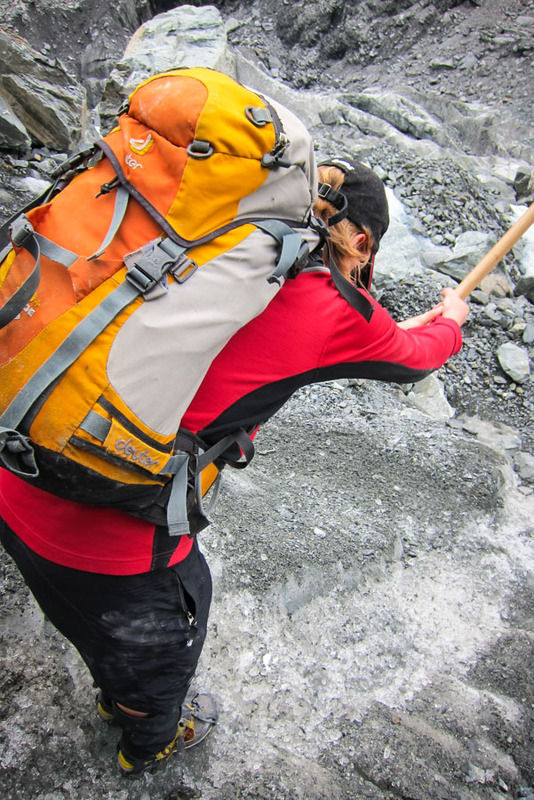 A mini mountain of rocks, with narrow and steep pathway had us panting for breath. 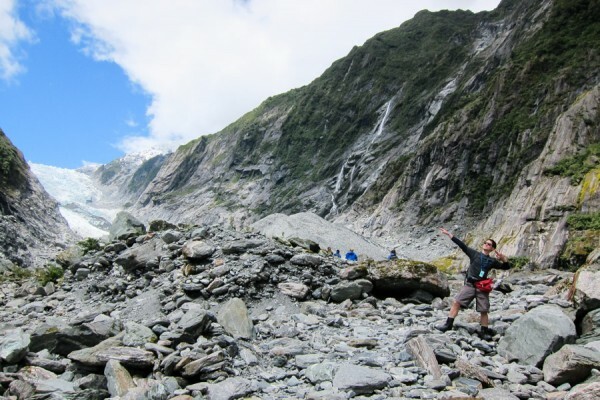 It was tougher getting to the glaciers than I initially anticipated. Once at the foot of the glacier, our tour began. We were briefed on how to put on our shoes, things to avoid and other things to look out for. Glacier conditions change every single day, so guides have to pick down the trails to ensure safety for the group. 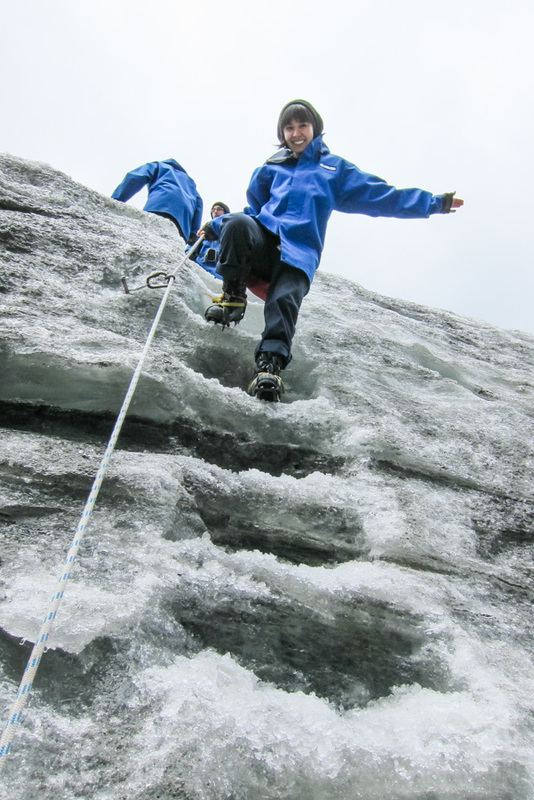 When you get to the ice portion, it’s time to switch your shoes for some scary & stylish crampons. Then it’s ice ice baby time from there. Kind of reminds you of Middle Earth. 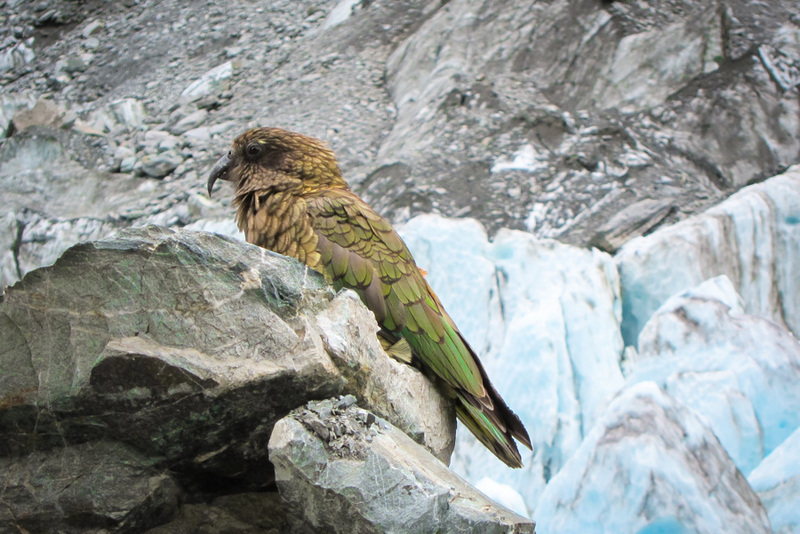 We also stumbled upon the Kea aka the green curious mountain parrot that likes to steal things when you’re not looking. 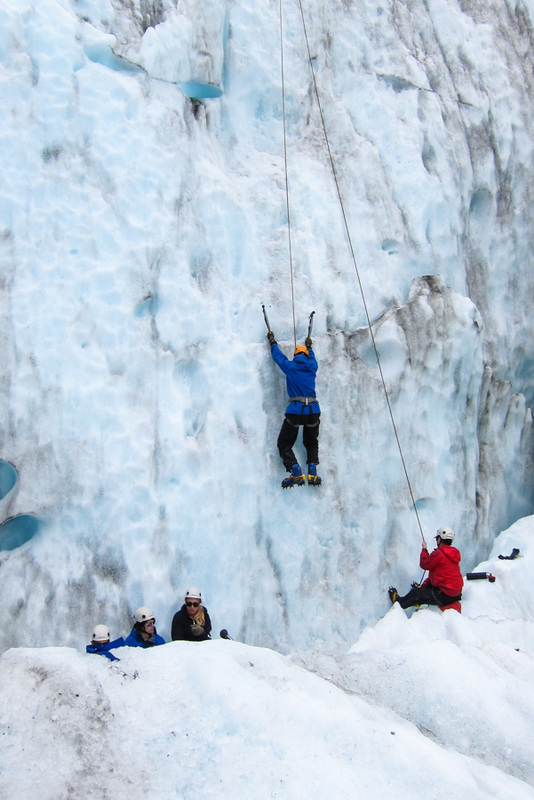 If you’re looking for a good workout, you can even climb these ice walls. Coming back down you’ll see the view of the valley… Most of this used to be covered in ice… Now sadly it’s fading away. Product of global warming? After a day hiking the glacier, it’s relaxing to wind down and relax your muscles at the Glacier Hot Pools back in town. Q was pretty tired towards the end of the hike, so we’re glad we took the half-day package (plus we saved some money too). 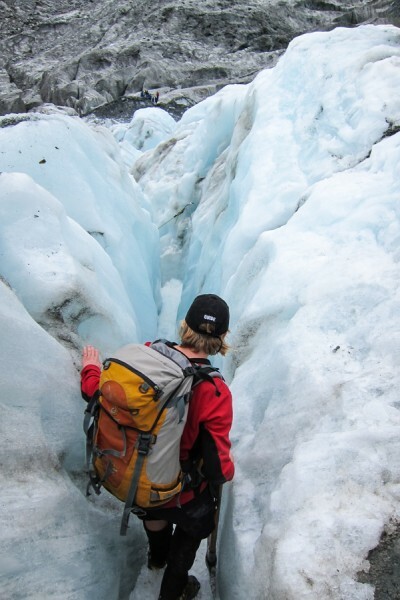 Looking back, we got a good taste of the glacier hiking experience, but it would’ve been nice to get higher and deeper into the belly of the beast. How about you? Does glacier hiking sound like something you’d want to do? 7 Reasons to Snorkel the Great Barrier Reef with Calypso! Boohoo, I’m so jealous! 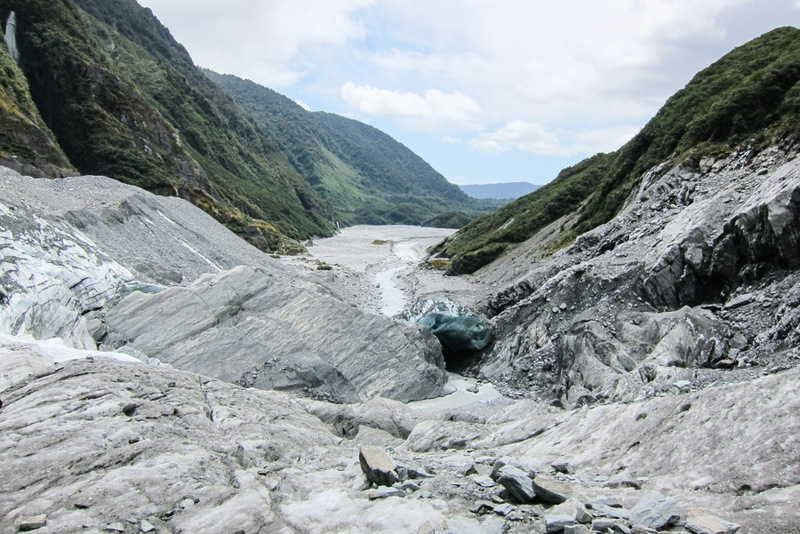 I had made a long car journey from the East to West coast of the South Island just so that I could do some glacier hiking at the Fox Glacier. 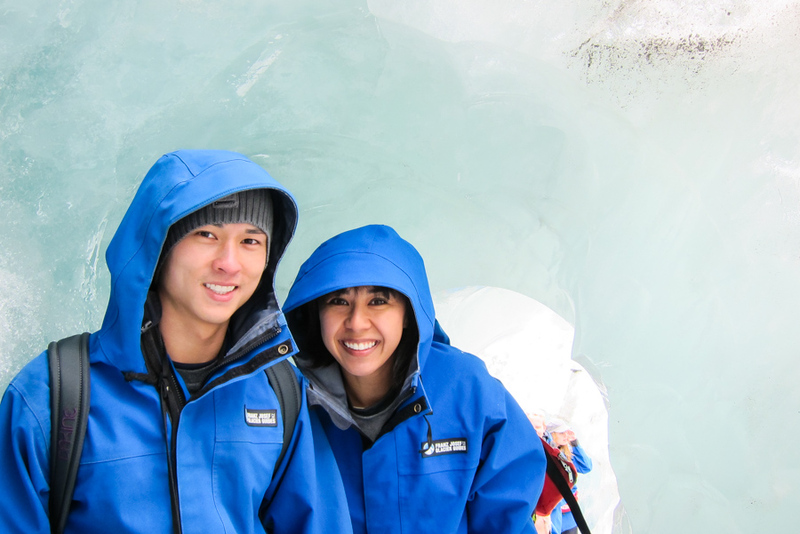 There was non-stop continuous rain the day before I was due to go so my glacier hike got cancelled. I was gutted as I had to leave the following day and so did not get the chance to do it. Your photos look awesome fun though! I am completely jealous of this experience. Adding it to my bucket list asap! The bucket list grows again! How big is it now? What a lovely experience – I think I would still be scared! I would love to do most of this. 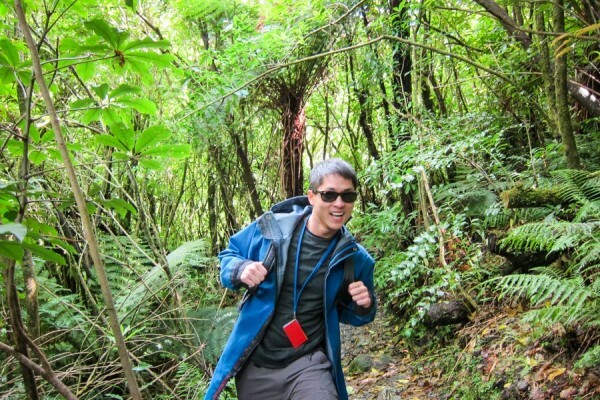 I have no interest in climbing, just hiking. I liked the two townships associated with each of the Franz Josef and Fox Glaciers. Visiting in winter (July) meant lower traffic, and easy conversations with either permanent- or transient-residents of the townships. 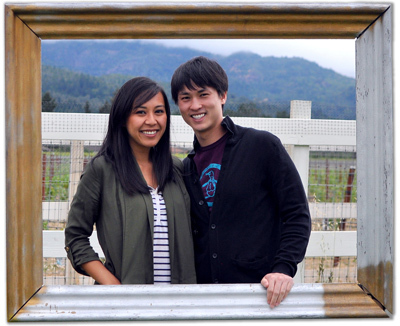 Love the photos here! That would’ve been ‘cooler’ indeed. 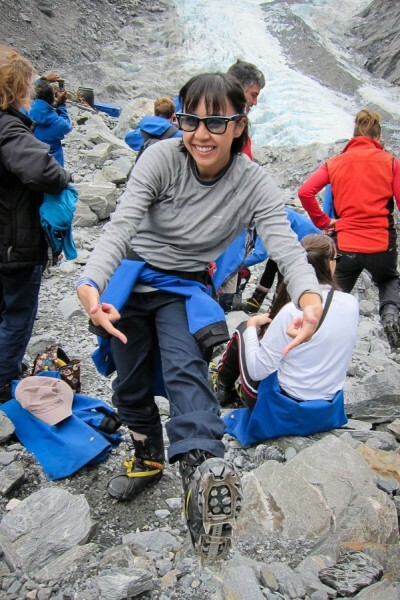 Although I didn’t mind being able to hike the glacier in shorts during the summer. no way! Aww.. that’s so sad. Got we got to experience it when we did. THanks for the update. 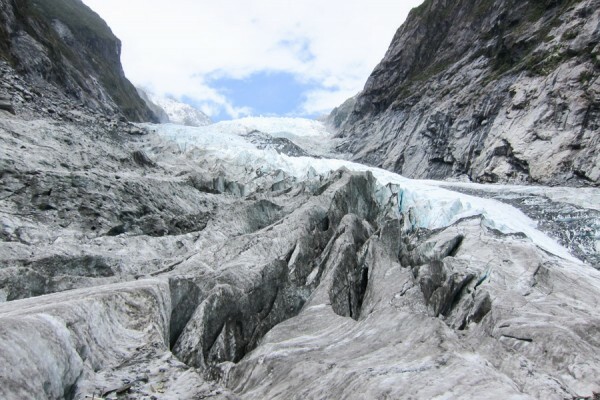 Glaciers fascinate me, even more so knowing one can hike/walk INTO one. Awesome experience for you, I’m sure. whoa baby! 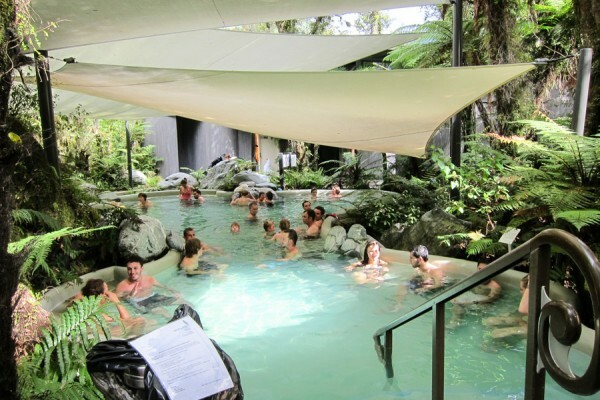 we skipped this in nz due to timing and now i’m kicking myself. looks amazing! 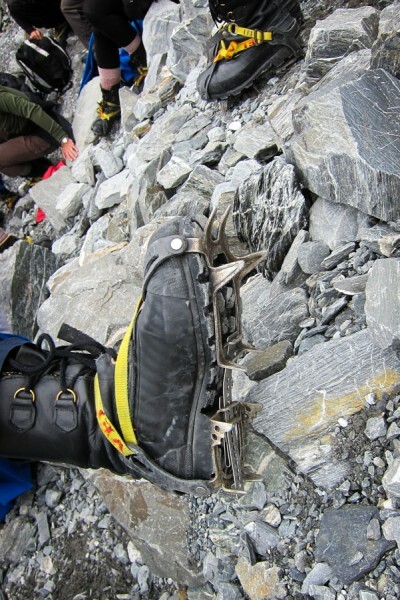 q really rocks the crampons, btw. Looks like a great hike. 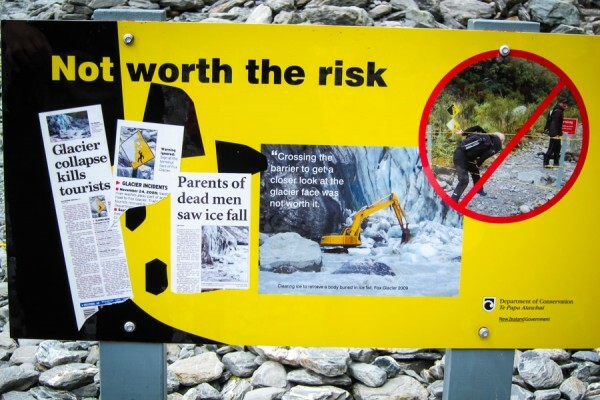 I have never hiked on a glacier. It is like one giant ice cube. 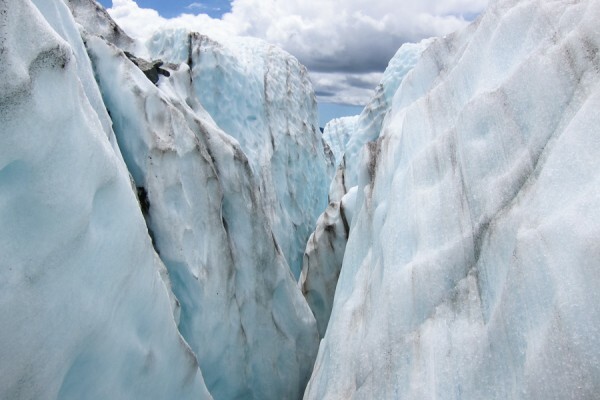 I would love to be drinking a scotch and just take a chunk of glacier and throw it in the glass. you know, i do think i’d be into glacier hiking. at least give it a go once in my life. Cool! You got to see a kea, too! I drove through Franz Josef, but elected to go to Fox. I think either are beautiful.